This entry was posted in candle fragrance oils, candle making supplies, candle recipe, Fragrance Oils, Natures Garden and tagged beeswax candle, candle making supplies, candlemaking supplies, democrat scent, democratic candle, easy candle project, easy candle recipe, fragrance oil, fragrance oils, fragranceoil, free candle recipe, free recipe, how to make a layered candle, how to make a star and stripes candle, July 4th candle, layered candle recipe, mom and me craft, natures garden, patriotic candle, political party candle recipe, soap making supplies, soapmaking supplies on June 12, 2014 by Deborah Ward. This Fourth of July, why not add a little more pizzazz to the party! 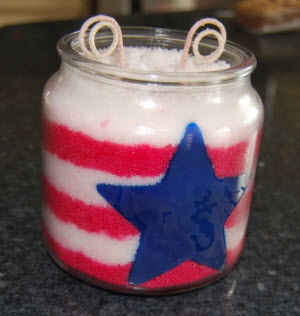 Making your own Patriotic Candle using beeswax and Pillar of Bliss is a fun and easy project that even the little ones can help with. You can easily make a candle for each political party using Natures Garden’s Political Fragrance Oil Line. This would include: Democrat Fragrance Oil, Republican Fragrance Oil, and Independent Fragrance Oil. 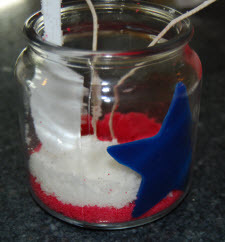 For this blog, the creative team at Natures Garden is going to show you the step by step instruction for just how easy it is to make your very own patriotic candle. The instruction is very simple to make one 16oz. candle and you will only need a few supplies to complete it. Next, weigh out 50 grams of the beeswax. Place all of the pastilles into your pouring pot (or a second smaller pot). 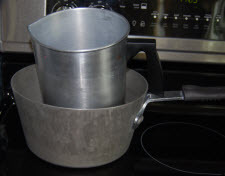 Then, place the second pot into the first pot. This method of melting down the beeswax is known as the double boiler. Keep an eye on the beeswax. Once the water starts heating up, it will not take that long to get the beeswax to a liquid state. Plug in your hot glue gun. 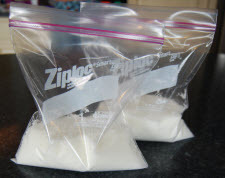 While you are waiting on the beeswax to melt, get your 2 Ziploc bags. Using your scale, weigh out and place 225 grams of Pillar of Bliss wax into each bag. Next, place one bag back on the scale. Add 18 grams of Democrat fragrance oil. Repeat with the second bag. 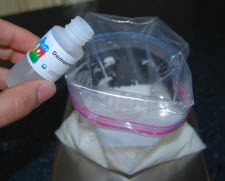 While the second bag is still on the scale, place 4 drops of Spectrum Red Candle Dye into the bag. Then, seal each bag shut. Then, shake them vigorously. 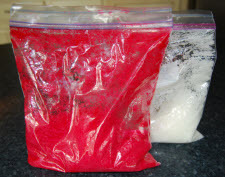 This will disperse the fragrance oil among the wax as well as incorporate the red dye. At this point, you will have 1 bag of white wax and 1 bag of red wax. Set aside. Check the beeswax. 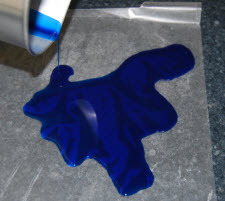 If it is melted, place 2 drops of Blue Spectrum Candle Dye into the wax. 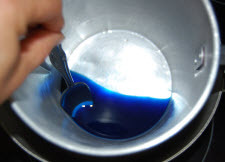 Using the mixing spoon, gently stir the blue color in. Place the beeswax back in the heat source. Now, let’s prep the candle jar. 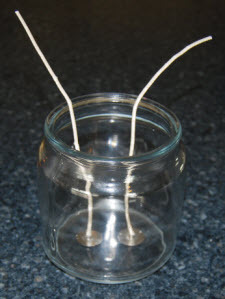 Using your hot glue gun, attach both CD 12 wicks to the bottom of your candle jar. Make sure the wicks are centered and equally spaced apart. Next, lay out a piece of wax paper. Remove your beeswax from the heat source and turn your stove off. Next, add 4 grams of Democrat Fragrance oil to the blue beeswax and stir. Once incorporated, carefully pour the beeswax onto one area of the wax paper. Allow this to set up at room temperature. This should take a few minutes. When the beeswax has cooled to the touch, remove it from the wax paper. Set the beeswax on your cutting board. 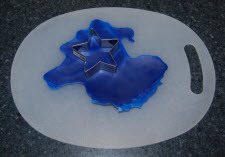 Then, using your star cookie cutter, cut out 1 star shape. 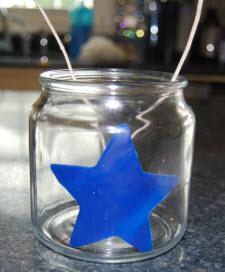 Next, place the star into your candle jar. Try to center the star between your candle wicks. Press firmly to allow the beeswax to adhere to the side of the jar. Once the star is adhered, get your two disposable spoons and white and red wax. Starting with the red wax, place several scoops into the jar. Then, gently flatten the wax across the bottom of the jar. Once you are happy with the amount of red, repeat with the white wax. Try to keep your layers all the same size. You will be rotating the layers between the red and white wax. Keep doing this until your candle is filled. Remember to straighten your wicks as you work your way through filling the jar. When your candle jar is full, simply trim your excess wicking. Then, light and enjoy your patriotic candle. 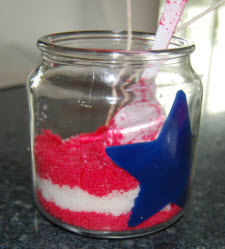 So now that you have the instructions to make your very own patriotic candle, feel free to make it your own. Really, once the beeswax is colored, scented, and cooled; any other portion of this project can be made with the assistance of children. They really have a blast cutting out the stars and filling in the layers (with adult supervision).